Fresh Apple and Toasted Walnut Cake with Warm Apple Cider and Brandy Sauce. 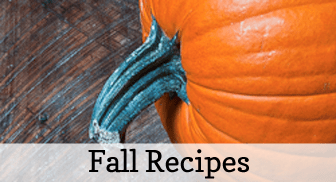 How about a dessert that celebrates the goodness of the fall harvest? This Fresh Apple Toasted Walnut Cake is so delicious it had me dreaming about making another one, as soon as the first one was gone. It is dense, and moist, and crisp, and crunchy, all at the same time. And what could smell more like fall than filling your house with the smell of roasting apples and cinnamon. You are going to LOVE this cake!!! The first time I tasted this cake was probably in my senior year of college, so it’s a little bit throwback/retro recipe for me. It came from the Silver Palate cookbook, a cookbook that introduced me to some really, really fine food, way back when. 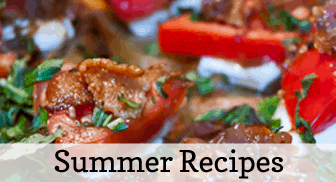 The changes I’ve made to this recipe have only made it even more delicious, in my opinion. It reminds me of a carrot cake, texture and color, in that it’s made with vegetable oil, so it’s super-moist with that crunchy-crusty exterior that I love so much. 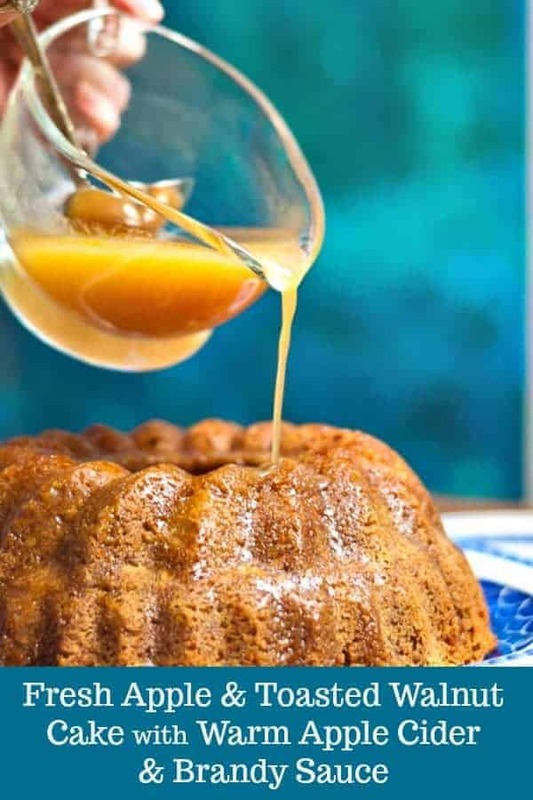 The apple chunks also add to the cake’s super moistnes, and the warm apple cider sauce that you pour over it is laden with an almost butterscotchy golden flavor, that’s been brightened by a squeeze of orange juice. The brandy adds depth of flavor and the cream makes it…well…creamy! Can you see how moist it is? 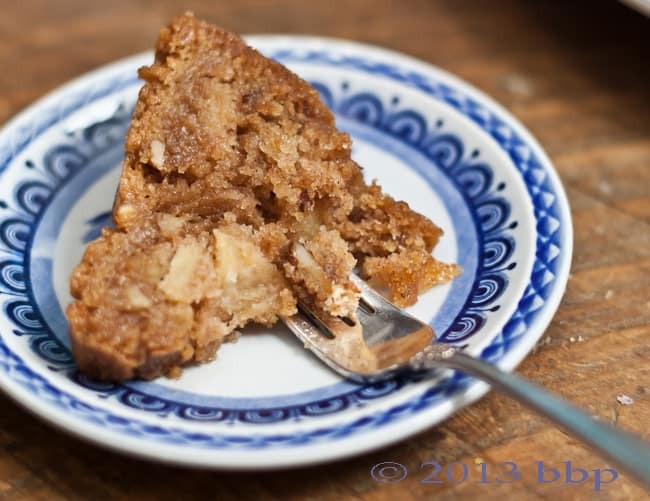 Fresh Apple & Toasted Walnut Cake with Warm Apple Cider Brandy Sauce is a perfect fall dessert. The original recipe called for Calvados (an apple brandy) or Applejack (a poor man’s Calvados), but since I didn’t have any of that, I decided to go with brandy (which I had on hand) and trust that the apple cider would contain enough apple flavor. It did. Another improvement I made in this recipe that I didn’t have access to way back when is that I now own my own flour mill, so I ground my own whole wheat flour. 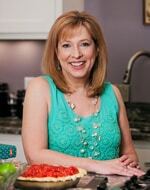 The flavor and texture of freshly ground whole wheat flour just cannot be compared to store bought whole wheat flour. If you don’t have your own mill, the very best substitute I have found is King Arthur Whole Wheat flour. Just be sure it’s fresh: whole wheat flour contains the oil of the bran, which causes it to go rancid much much faster than regular flour. So, if you have a bag on hand, be sure to give it a sniff, to make sure it hasn’t gone over the edge. The original recipe called for Rome Beauty apples. I didn’t have any of those, but what I did have was a variety called Cripps Pink: sweet and slightly tart, it had the perfect flavor. Plus, they weren’t particularly crisp, which is how my daughter and I like our apples, so I needed to use them somehow in a recipe, and this recipe was absolutely perfect using them. One other slight change I made that improves the flavor of this recipe over the recipe I knew in my youth, was to toast the walnuts before I used them. Toasting a nut is super easy to do, and brings a richer flavor to the nut’s natural oils. It also gives the nuts a crispier texture. So, it really is a step worth doing! I simply measured the nuts I needed into a small sauté pan, put them over a medium high heat, and heated them for 2-3 minutes, stirring them often as they toasted. You can tell the nuts are ready by using your eyes but most especially, by using your nose. When they start smelling great, they’re ready. Ten seconds more can cause them to burn, though, so watch them closely! To stop the cooking process quickly, simply pour them out of the pan and into a saucer. 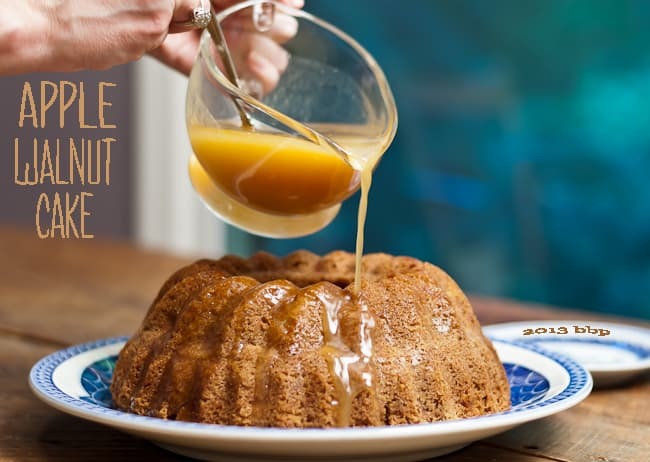 A delicious taste of fall: fresh apples, apple cider and toasted walnut make a dense, moist cake that is topped with a golden sweet cider and brandy sauce. In mixer, beat vegetable oil and sugar until thick and opaque. Add eggs, one at a time, beating well after each addition. Sift together all purpose flour, cloves, cinnamon, nutmeg, baking soda, and salt. Then sift in whole wheat flour. Add to oil and egg mixture, and mix just until blended. 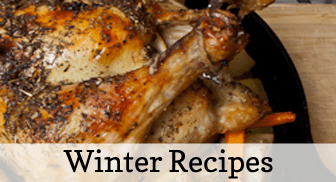 Add toasted walnuts, apple chunks, and brandy all at once, and stir batter until chunks are evenly distributed. Pour batter into a greased bundt pan. Bake for 1 hour and 15 minutes, or until a cake tester inserted in the center comes out clean. Let cake rest for 10 minutes. Then unmold and pour glaze over warm cake. 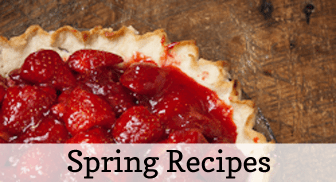 (You can also cut the cake, and pour the glaze over slices. While cake is baking, melt butter in a small saucepan, and stir in both sugars. Add remaining ingredients, stir and bring to a boil. Reduce heat slightly and cook for 4 minutes. Remove from heat and cool slightly. Pour while still warm over cake. This lovely lusciousness is really a perfect fall dessert. 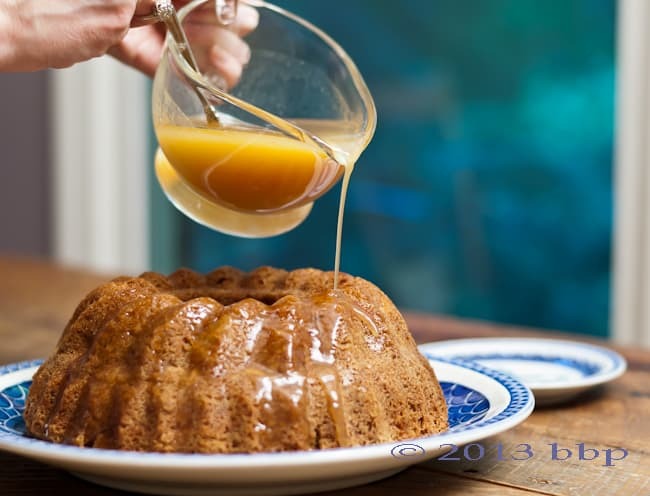 Fresh Apple & Toasted Walnut Cake with Warm Apple Cider Brandy Sauce is a perfect fall dessert. This is the shot you’ll want to pin to Pinterest.